Many people say to me that they do not know what God’s plan is for their life. This being considered, in order to know our role there are several things that we must consider when trying to discern this. What most people do not consider is that everyone, believers and nonbelievers, are part of God’s plan in His kingdom. 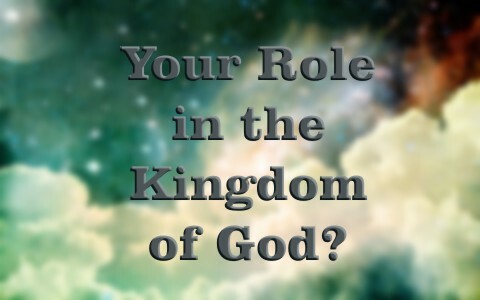 The question is, do you know your role in the kingdom of God? Does God have a plan for His kingdom? In this passage, we see God’s plans to destroy Syria along with other nations that come against the Jewish people. First, we see that God has sworn that He will bring it to pass, which tells us that God has made a promise to His people. Second, He has thought out a plan and will bring it to pass for the purpose or reasons that He has determined to be important. Third, He has specifics that He will bring to pass. Fourth, this plan includes the whole earth and will be carried out by His hand. Finally, for God’s reasons or purpose, no one can annul God’s plan, nor does anyone have the power to stop God from carrying it out. Therefore, it is very clear that God has a plan for heaven and earth that will be carried out. The question is what is His plan and what will be our role in it? Looking at these two aspects of the kingdom, we see that Jesus said, the kingdom is coming by God’s will in earth as it is in heaven. This tells us that God has a plan to establish His kingdom on this earth as it already is in heaven. We can see from Scripture many references of God’s kingdom as it already exists in heaven. It includes, a throne. It includes angelic beings. And, it includes people (Psalms 11:4; Psalms 103:19-22; Revelation 4-5). All are living in an eternal state of perfection and perpetual worship in the direct presence of God. Jesus also mentioned that when we die as believers, we will be with Him there in His Kingdom in what He describes as paradise (Luke 23:39-43). We also see many references in Scripture that God will establish His literal kingdom in earth. The beginning of which is when Christ returns to earth to literally set up His kingdom as part of the 1000 year, or millennial reign of Christ on earth (2 Samuel 7:10-16; Revelation 19-20). As we saw in Matthew 6:9-13, the kingdom and everything that goes with it belongs to Christ, kept by His power and reflective of His Glory. What is our role in God’s kingdom? It is clear from Scripture that God has a role for us while we are on this earth awaiting the day when He calls us home to His kingdom and also after he sets up His kingdom on earth. Right now while we are on this earth, God tells us there are several things that he wants us to do. In the Old Testament, He told the Israelites to do several things (Deuteronomy 10:11-21; Ecclesiastes 12:13). He told them to go and take the land that God had given them. He told them to fear the Lord and walk in His ways. He told them to love Him and serve Him with all their heart and soul. He told them to keep the commandments. And, He told them to circumcise their hearts, love their neighbor, serve the Lord and cleave to Him. that we would receive eternal life (John 17:1-5). that we believe on the Lord Jesus Christ so that we would be saved and not perish (John 3:17; Acts 4:10-12; Acts 16:25-34; Acts 17:29-31; 2 Peter 3:8-10). that we would have knowledge of Him through His Word (John 17:6-10). that we would be united, joyful, and live a holy life (John 17:11-16; James 1:26-27; 1 Peter 1:13-16; 2 Peter 3:11). that we would be sanctified or made holy through His Word (John 17:17-19). that we would reflect His glory and love (John 17:20-26). Paul reinforced these things practically when he told Timothy to preach the Word without hesitation in all situations, reprove, rebuke, and exhort with all longsuffering and doctrine. He added to endure afflictions, do the work of an evangelist, and make full proof of His ministry (2 Timothy 2:1-7; 2 Timothy 4:1-5). Finally, when Christ sets up His kingdom on earth, we have roles from the beginning. We come with Him from heaven to establish His kingdom on earth (Revelation 19:1-20:4). God will gather us all together to serve in His kingdom with David serving as a prince (Ezekiel 27:21-27; Matthew 24:29-51; Matthew 25:31-34). And, our role then will be to worship the Lord, build houses, plant vineyards, and enjoy the fruits of our labors with Him forever (Isaiah 65:17-66:14; Revelation 21-22). Many people say to me that they do not know what God’s plan is for their life. However, if we look at Scripture, we see that while we are living as mortals on this earth, our role in God’s kingdom is to demonstrate our love of Christ by sharing the gospel of salvation to the entire world. We do this by trusting Christ as our Savior and doing everything we can to allow God to change us into the image of His Son (Romans 8:28-31). By being changed into His image, we are best prepared to have success in fulfilling our role in His kingdom. Something more that might interest you: What Does the Bible Say Heaven is Like? Previous post: Why Doesn’t God Save Everyone? Next post: Did The High Priest Have A Rope Tied Around Him When Entering The Holy of Holies?